So.........on the morning of Tuesday 1st August I drove myself to San Diego airport in good time for my flight, had a quiet panic (it was very nearly a loud panic!) 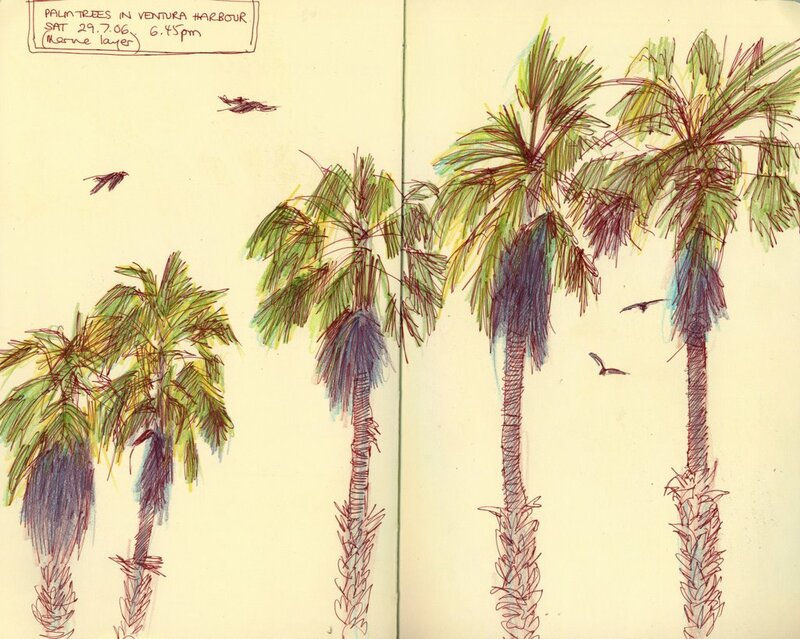 when I couldn't find the car rental place and then sat around watching planes - and sketching (see above!) - before flying home. So time for some reflection (both then and since) - what did I learn on this trip? I probably produced more work within a three week period than I've ever done before (albeit much smaller than I normally work). 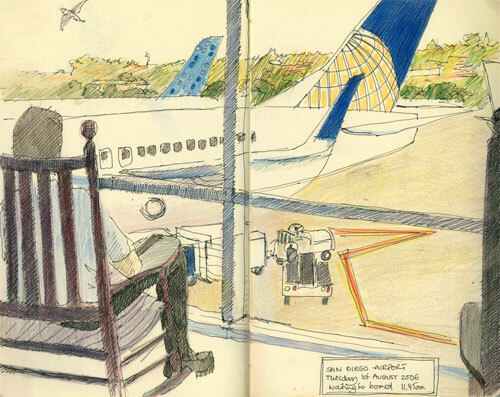 Having a travel sketchbook to complete is a great incentive for pulling out the pen and pencils! 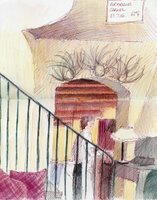 Trying to sketch every day for three weeks is difficult - and I didn't achieve it. However, I made up for it by regularly producing more than one sketch a day. 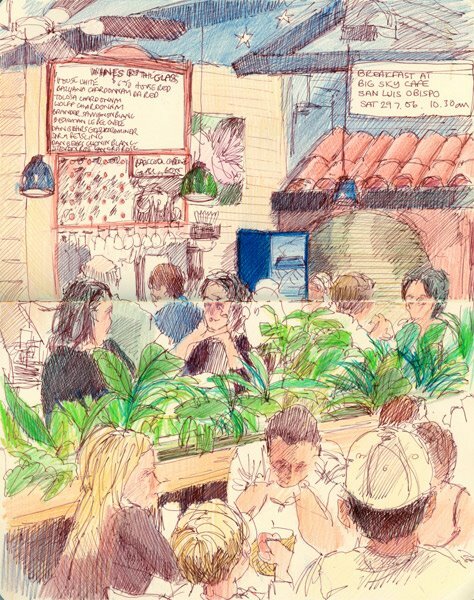 As a result, I'm now much more impressed by those artists who produce drawings and paintings every day. That's takes hard graft to keep up day after day after day without fail. I'd done so much staring during the three weeks that when I got home I felt like I didn't want to look at anything much and was quite pleased to be preoccupied sorting out work for two exhibitions instead! I didn't get much 'bigger work' done. My normal art holiday would involve me aiming to start a painting in the morning and another in the afternoon - and I'd often complete at least one. Typical 'daily paintings' done on holiday in the past included large (19.5" x 25.5") plein air pastel paintings done in around 3-4 hours (see my website for examples) on an abrasive pastel support. BUT then I opted for the smaller suitcase which transports more easily and hence I couldn't get this size of support in.........so I might need to rethink suitcases! I discovered it's possible to sketch while travelling in the front seat of a car. This partly depends on the scenery staying pretty similar for some distance - but it is possible and probably easier in somewhere like the USA than some other countries because of the nature of the landscape. If you sometimes do long distance trips with somebody else driving it's well worth giving this a go - it makes the time pass ever so quickly as well. The art shops I visited in the USA were consistently very much better than the ones in the UK - period! I am so envious! Landscapes (like a lot of things in in the USA) can be astounding and monumental - and subtle and small - and all on the same day! All the different places I visited certainly gave me a lot of food for thought in terms of how to portray different kinds of landscapes - and I'll be interested to see how this progresses into more finished work over the winter. Travelling with a full set of pastels is not easy when you're away for three weeks and also visiting a lot of different places. In the end there was just no room for the pastels on the Albuquerque trip and they had to stay in California. However I found that bags which compress the air out of your clothes enabled me to have a bit of choice over what I wore with the space I had left. They're also a great option for packing a car boot if the only alternative is a bag which is too big for the space available. I was really glad that I had the security of cover offered by new membership of AAA and my new american cell phone. As a result I didn't worry about what might happen if anything happened while I was travelling on my own. avoid driving long distances on successive days. So finally I arrived home.............to find that yet again my 'plein air' chair, which has travelled all over the world with me without a problem, had gone astray for the second time on this trip!!! It was safely returned the next day and where it got to this time I have no idea - but it's now officially much better travelled than I am! Sunday 30th July: The end of my drive down Highway 1 and the start of "concrete freewayville"
Mel Gibson got caught speeding on Highway 1 in Malibu on 28th July and was arrested for drink-driving. I came through on the 30th July with no such excitement but there again I was observing the speed limit and it was daylight.......... I even had sun for the first time in what seemed like a long time! By now I was really tired from all the driving and just wanted to get back to San Diego. Unfortunately, first of all I had to negotiate the mammoth concrete freeways of Los Angeles which was not something I was looking forward to! I prepared for the onslaught by stopping at the Hideaway Cafe in Malibu for brunch. For such an out of the way place (it was up a very steep drive) I was really disappointed that there were not more stars to collect autographs from ;) and was about to sniff with disappointment when the couple next door sent a small child off to collect an autograph. I know not who it was from or indeed whether it was for the child or the Dad - but I suspected the latter! 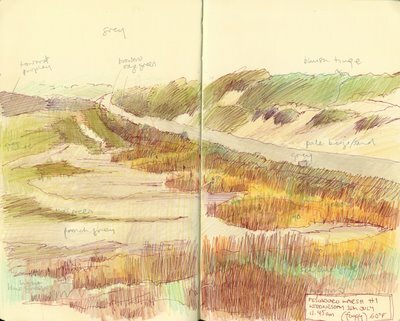 I sat on the outside deck and first of all sat one side of the table and drew the scene out to sea and then swopped around and drew the view inland. I can't look at these sketches without hearing the sound of Harley Davidsons which would periodically roar down the highway - indeed the first sketch records that I eat Eggs Benedict to the sound of Harleys - par for the course on Sunday morning I guess! Malibu was really weird. There were no real stopping places and the houses were jammed up together right at the ocean's edge - it was basically just one long strip. I kept wondering what would happen if they had a really high tide. But there again, I was passing through a state where many people live on or near a place where two major tectonic plates collide so I guess my overall conclusion was that Californians have a built-in aversion to worrying about where they live. And so I arrived back in San Diego - to the news that the weather had not picked up at all and that Louise and her dearly beloved had been under cloud all week! Saturday 29th July: The best breakfast of the trip - at the Big Sky Cafe! I left Morro Bay under a cloud - you think I jest? Take a look at the photo! I know they do things bigger in the USA - but I wasn't quite expecting this to apply to the clouds. I should be able to see a great big rock sticking up out of the ocean instead of which all I could see was a bit of rock and an awful lot of cloud. The marine inversion was obviously going to persist for a bit! I had the best breakfast of the whole trip at the Big Sky Cafe - highly recommended by me for anybody who's ever in the area (are you listening Ed?). Apparently the LA Times agrees - check out the Big Sky Cafe website (and the sound track!). The menus were great - with good healthy food with leanings towards organic. In fact it was so good that I got them to make me up a lunch as a take-away! 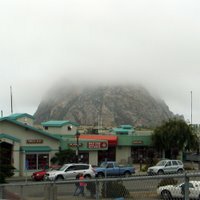 I've only now discovered while finding the website and the reviews that they were voted the Best San Luis Obispo Restaurant in 1997, 1998, 1999, 2000, 2002, 2003, 2004 and 2005! I can't say I'm surprised. 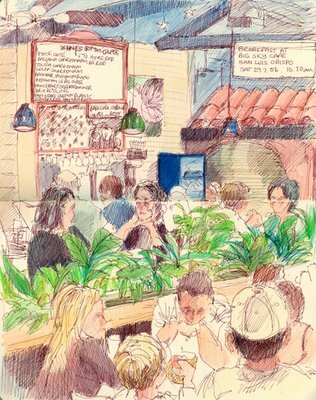 This sketch of the cafe was one of those weird ones where it almost draws itself - it went amazingly fast considering the detail and the fact that I was eating breakfast. I cheated on the backboard as they had two columns - but I don't write that small. I loved their stars on the blue ceiling. There's also a great photography shop/suppliers on the main street - with friendly staff. I continued down Highway 1 but it swung inland away from the coast. The weather improved as a result and I began to see some of the Californian countryside of the sort I associate with Californian landscape paintings. As I drove along, I began to realise that each day of the trip down Highway 1 had to contain a fair degree of slog in the car to get to the next place - and it was getting tiring. I stopped the night in Ventura - and had this view from the balcony of my room. Friday 28th July: Driving down Big Sur - at last! After I left Point Lobos in the early afternoon, I continued down Highway 1 and along the coastline of Big Sur. 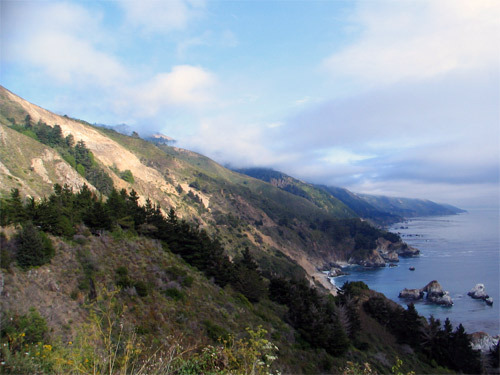 Big Sur is the coastline and immediate area inland which stretches some 90 miles (145km) along the coastline between the Carmel River and the San Carpoforo Creek. It extends about 20 miles (32km) inland. It's a truly amazing coastline with great views - both along and down(!) and seeing and driving down Big Sur is something I've wanted to do for a very long time. The marine inversion continued for the most part. Here's an illustraton of what I mean. Note also the steep sides - this is not a road to take your eye off the road so you can admire the view - you need to use the various stopping places en route to do that - and you'll be in good company as everybody else is doing the same thing! Driving south down Big Sur (as opposed to north) means you get to maximise your focus on the road for some 90 miles as you're driving hairpin bends on the side next to the very big drop! As I began to drive down the Highway, I began to realise that driving the Big Sur was going be very tiring, would take some time and that stopping a lot was maybe not the best idea. 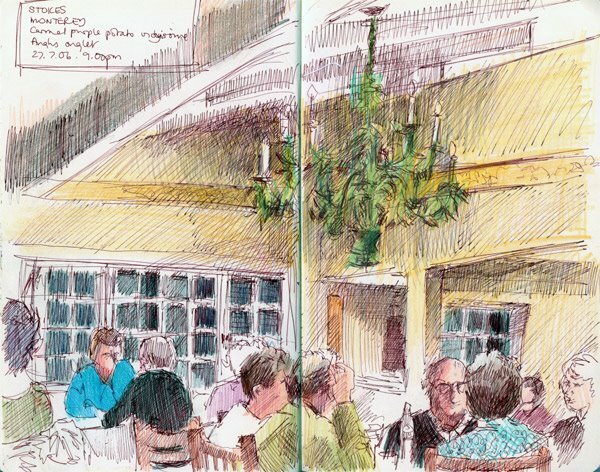 So sketching was limited and I skipped a visit to the redwoods and San Simeon and the Hearst Castle and still arrived in Morro Bay rather tired.....well actually I could use a lot stronger expression than that - but not in public! I'd definitely recommend taking your time travelling down Big Sur. Also be aware that it's a very popular place to visit and accommodation can be booked up a long time in advance. 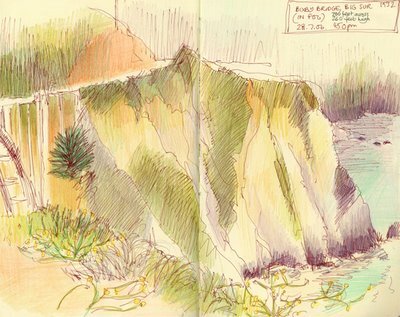 The sketch is of the area next to the Bixby Bridge. The bridge was one of the largest and tallest bridges built when it was constructed in the thirties. It transformed the life of people who lived in the area. When I sketched it the bottom of the cloud was only just above the aurface of the road! Friday 28th July: "The greatest meeting of land and water in the world"
"The meeting of land and sea, Point Lobos"
Landscape artist Francis McComas's brief but extravagant comparison remains unchallenged. 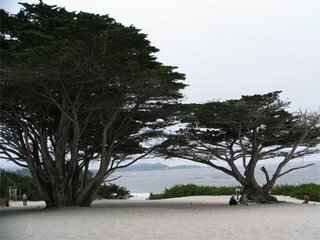 All who come here agree that the beauty of this tree-clad headland is unequaled. 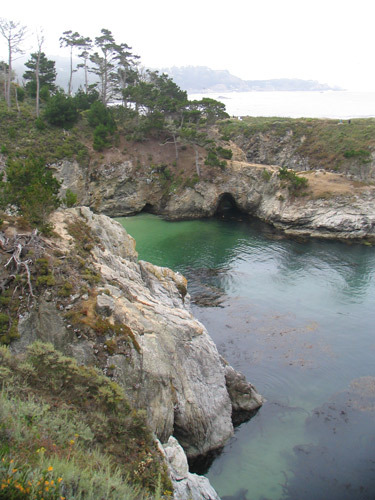 Point Lobos State Reserve has outstanding passive recreation values, such as sightseeing, photography, painting, nature study, picnicking, SCUBA diving, and jogging. In addition to the spectacular beauty, nearly every aspect of its resources is of scientific interest. There are rare plant communities, endangered archeological sites, unique geological formations, and incredibly rich flora an fauna of both land and sea. I was totally knocked out by the reserve but rather less so by the number of parking spaces available. I guess that's the price that is paid for avoiding it becoming too overrun with tourists like myself - even if I am wielding a pencil and trying to record it. Highlights for me included: the totally stunning wild flowers, plants and trees; the enormous kelp forest seen from above(! ); the pelican beach (see the photo) and the brown pelicans diving for fish; Bird Island; the clear aquamarine of the water - and most of all the colour palette of the area. I'm really going to enjoy developing future artwork arising from this visit. 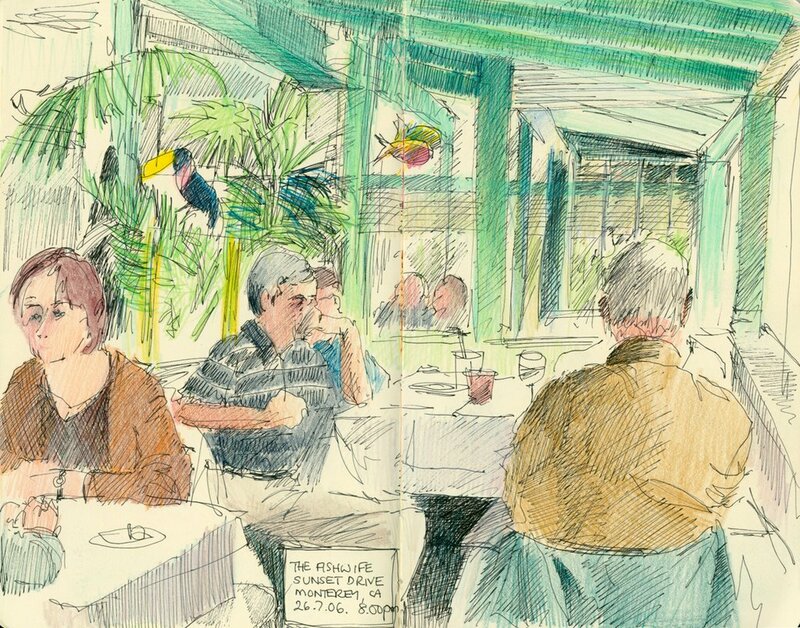 The sketch at the top of the page is a larger one than others on this trip and was done on 'Blue Haze' (a very pale teal blue) Colourfix not dissimilar to the colour of the sky and sea. It's a colour study for (probably) a pastel painting. The subject is a marine terrace - created from clay and pebbles from eroded rock which was laid down as sediment 2 million years ago (ie it's recent!) 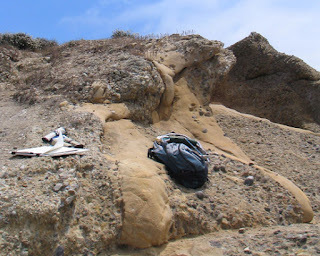 and compressed and folded to create new rock. I majored in Geography for my degree and have studied geology - hence the odd geological diversions on this trip! The flattest piece of "comfy rock" I could find to sit on! It wasn't the most interesting view I saw while I was there but the paths near the more spectacular views were very narrow. Instead, after a good walk round, I opted for a more 'comfortable' seat on a sloping rock - I invariably opt for the comfortable spots! As with many other places which are popular with artists, there in the car park, when I got back to the car was another artist packing up to go home. We exchanged notes about day - and then another artist joined us. It's great painting out doors - just like being part of a club without a name where you don't know any of the members but you know who they are when you see them! 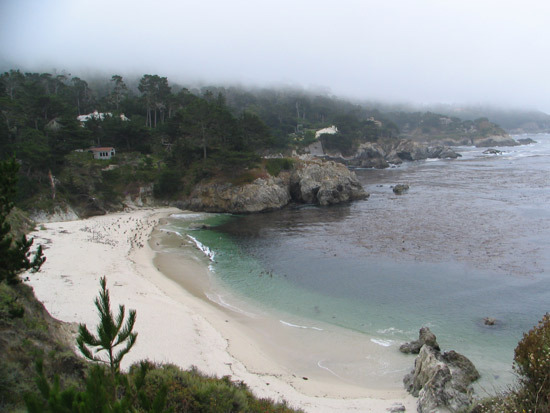 Thanks again to Ed Terpening of Life Plein Air for giving me the tip off about Point Lobos in his draft digest of plein air painting locations on the Northern California coastline which I was 'road-testing'! 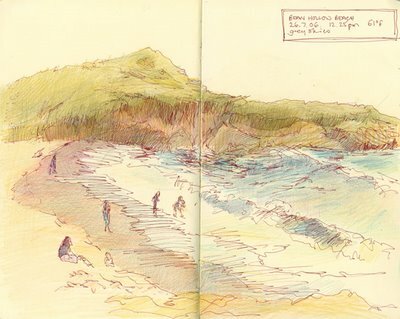 Pen and sepia ink and coloured pencil in Moleskine sketchbook 8" x 10"
On Thursday I decided to go to Carmel pr 'Carmel-by-the Sea'. I've always been intrigued by it as a place, ever since I learned about it when Clint Eastwood was Mayor! 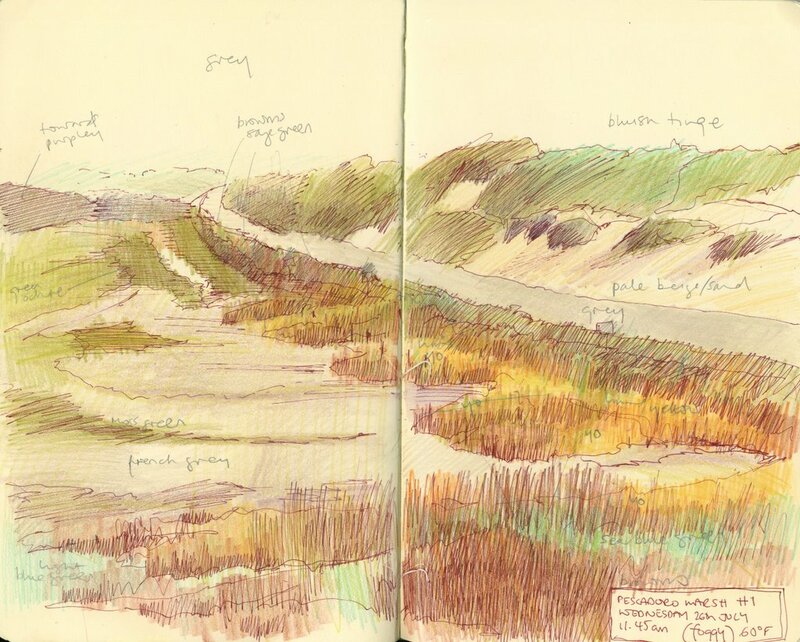 The above sketch is as colourful as it got that day as the whole of the Monterey peninsula seemed to be suffering from a marine inversion. The sky was grey, the clouds were very low, the sea was grey - and the 'plein air' was hovering just above 60 degrees - where was the sunshine? 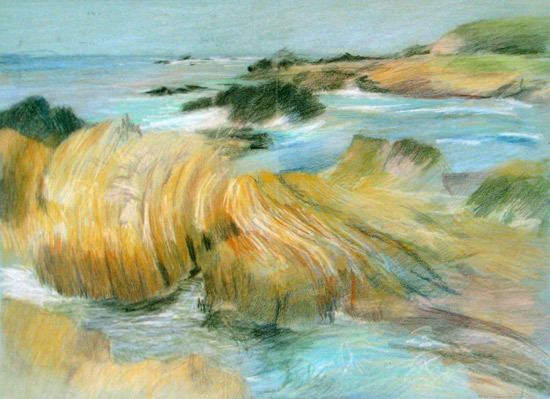 I did try to do a plein air pastel painting on the beach - honest - but it was soooooooooooo cold! Sitting still means you get a lot colder than when moving around. I found after not very long that I just couldn't focus and was continuously thinking about long it would take to turn back to my hotel and go and find as many layers as I could. It wasn't as if I hadn't come out prepared - but I was still very cold. So I have a pastel which has been started and which I will probably try and finish - but it'll have to be with the aid of photos and my very vivid memories of that morning on the beach! This is the view I would have been doing if it had been warmer - and the view would have been bluer instead of grey! This is the very uninteresting sketch of the view from table at lunch at the Portabella restaurant. I had the option of sitting outside but inside was warmer! This was compensated for by the much more interesting view on my plate - the remnants of which you can see in the sketch at the top of the blog. The restaurant gets great reviews in Trip Adviser whereas I'd have characterised is as good but not stunning. In the afternoon, I decided to have a tour of the art galleries in Carmel to see what rated as art in a place like Carmel given that it is a small community which was founded by artists and writers. There are an enormous number of artists associated with the galleries - and there was a very wide range of work on offer. However most of the art had little or no association with Carmel or Northern California and I didn't 'rate' quite a lot of it. Looking back there's only one gallery where I can remember contemporary and/or plein air local landscapes which I liked. Given its location and artists, I think it was the Nancy Dodds Gallery which describes itself as a world away from the rest of Carmel Galleries - which this gallery certainly was! 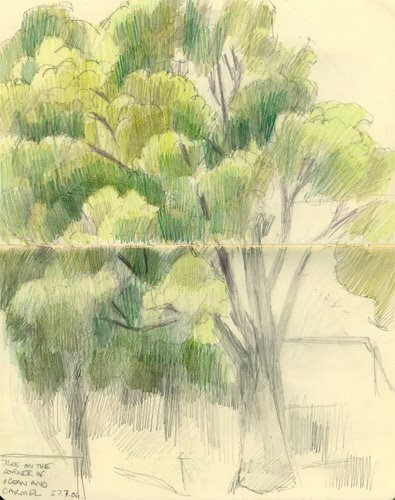 This sketch of a tree at one of the intersections on Ocean was largely done because I'd been on my feet for too long and desperately needed to sit down for at 10 minutes! In the evening I decided to walk around the corner from the inn I was staying at in Monterey and visited Stokes restaurant. It has some appalling reviews in its entry in Trip Adviser and I can only assume that it has changed hands or management recently as my own experience was very much better. In fact I'd go so far as to say it was probably the best restaurant meal on the whole three weeks. It's a bit silly though - having two large sketches of the meals and restaurants as the highlight of my visit to the Monterey peninsula! sepia ink and coloured pencil in Moleskine sketchbook 8" x 10"
Louise dropped me off at San Diego at about airport at about 5.30am so that I could catch the 6.45 flight to San Francisco and then the connecting flight to Monterey which would get me in about 9.00am. Almost the first thing I heard when I got to the check-in queue was that the San Francisco flight was late and I'd miss my connection. We'll draw another veil over the next hour or so except to say I declined the offer from United Airlines of a replacement flight which would get me into Montery at 8.00pm in the evening [raised eyebrow smiley!] and accpted the offer of a credit voucher to be used on a subsquent flight. 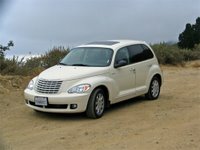 Instead I flew to San Francisco and picked up a car there which fortunately was not a big deal as it could have been (thumbs up for Alamo!). We'll just have a minor digression here while I remember what it was like in the airport car park trying to drive an automatic car for the 2nd time ever. Here's the car later on in the trip. Fortunately it was a car which I had driven before - with gears. I drove from San Francisco International down to Half Moon Bay to the south and west of san Francisco to pick up (State Route) Highway 1 - the Pacific Coast Highway. It is reputed to have some beautiful coastline and is designated an All-Americian highway. My intention was to drive down it as far as a I could. 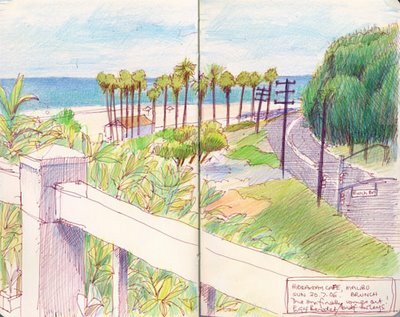 I was following Ed Terpening's (of the "Life Plein Air" blog) draft resume of places to to paint down the coast of California - which was excellent at leading me to the two locations identified in these sketches. While Ed's instructions were excellent, I wasn't quite prepared for the extent of the fog (marine inversion?) along the coastline - everything was very grey - and the temperature had dropped 50 degrees from that experienced on Monday - only two days earlier. It was quite an adjustment trying to get the colours right after days and days of bright blue skies - in fact it felt very like the grey cloudy day we had going through the Sonoran Desert on Monday morning. The first sketch (at the top of the post) is annotated with my code for different colours in order to provide extra assistance in working this one up at home . 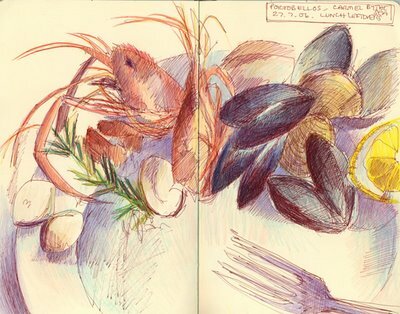 sepia ink and coloured pencil on Mole sketchbook 8" x 10"
Dinner that evening was at "The Fishwife" on Sunset Drive at Asilomar Beach This is the dinner menu. It's reputed have very good seafood. I know I wasn't disappointed - and I got a good table to sketch from. 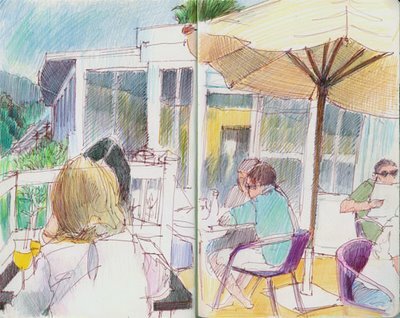 The people on the right came over afterwards - they had realised what I was doing and were delighted to be in the sketch! pen and ink and coloured pencil in Moleskine sketchbook 8" x 10"